Obama blasts "professional politicians" for holding up debt talks; says not raising debt ceiling would be "irresponsible"
President Obama said Monday it would be "irresponsible" for "professional politicians" to vote against raising the debt limit, arguing that "they know better" than to encourage the U.S. government to default on its loans. In a Monday morning press conference, the president reiterated the importance of raising the government's $14.3 trillion debt limit, and targeted "the voices in our respective parties" that are undermining ongoing efforts to do so. 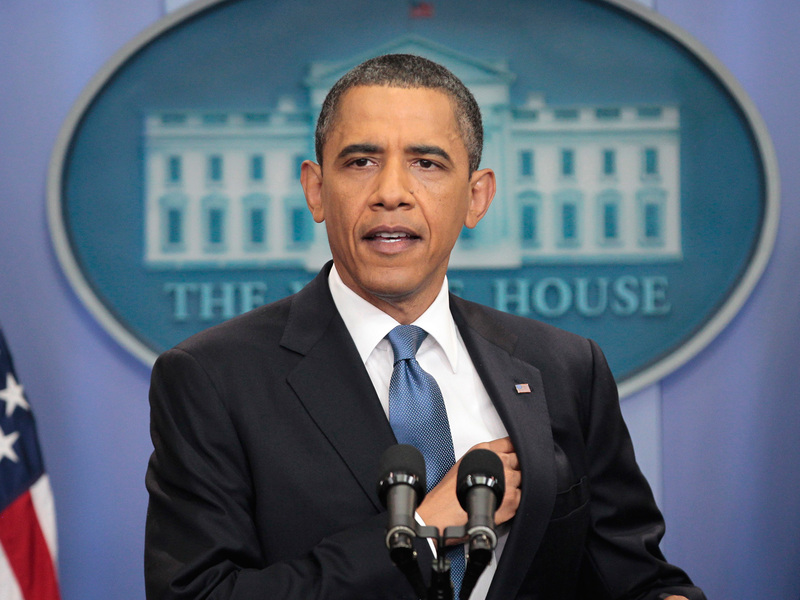 Responding to a question about the barriers to getting support for an increase - particularly in regard to "Republican presidential candidates, Republican Tea Partyers on the Hill, and the American public" - Mr. Obama made a strong distinction between "professional politicians" and average Americans. "Let me distinguish between professional politicians and the public at large," the president said, emphasizing that lawmakers, not the American people, were "paid to worry about" the debt limit. "The public is not paying close attention to the ins and outs of how a Treasury (bond) auction goes. They shouldn't," he said. "They've got a lot of other things on their plate. We're paid to worry about it." Mr. Obama argued, however, that "professional politicians" acting in opposition to raising the debt limit should be held accountable for their actions. "I will say that some of the professional politicians know better," Mr. Obama said. "For them to say that we shouldn't be raising the debt ceiling is irresponsible. They know better." Suggesting that so-called "professional politicians" were playing politics with the full faith and credit of the U.S. government, Mr. Obama noted that the purpose of raising the debt limit was not "as a means of doing all these really tough political things," but rather to prevent a renewed recession and economic catastrophe. "This is not something that, you know, I am making up. This is not something that [Treasury Secretary Timothy] Geithner is making up," Mr. Obama said, of the potentially dire consequences to allowing the government to default on its loans. "I'd rather be talking about stuff that, you know, everybody welcomes. Unfortunately, this is what's on our plate. It's before us right now. And we've gotta deal with it." Mr. Obama acknowledged that the politics of any deal would be "very difficult" in the Republican caucus as a result of the internal opposition from Tea Party members and conservative Republicans, and said that while he thought House Speaker Boehner was "sincere" in his intentions, the path ahead would be contentious. Bachmann, in a statement released after the president's press conference, confirmed that sentiment. Reiterating her pledge to vote against the debt ceiling increase, Bachmann invoked Mr. Obama's own opposition to a similar increase in 2006 as ammunition against him: "Back in 2006, [Obama] opposed an increase in the debt ceiling, saying that to increase the debt ceiling constituted a 'a sign of leadership failure,'" Bachmann said in the statement. "Well, I agree: It is a sign of leadership failure that he has failed to cut spending and control the growth of government. That's why I will not vote to increase the debt limit." She argued that Mr. Obama "has wrongly assumed that everyone agrees that we need to raise the debt ceiling." "The American people overwhelming disagree," said Bachmann. "I disagree." Nevertheless, Mr. Obama urged GOP leadership to "step up and do the right thing regardless of the voices in our respective parties that are trying to undermine that effort." "That's what compromise entails," Mr. Obama said. "You know, we have a system of government in which everybody's gotta give a little bit."